In my post for the week, I mention keeping an Advent Calendar. For many people, this is a much loved family tradition. If you don’t have a calendar, Trisha at 24/7 Moms has an excellent post on calendars you can make. cater to my own wants. and see those in need of You. This is one of my favorite advent hymns. Its fun to sing and leaves you in a great mood, reading to go out and DO. 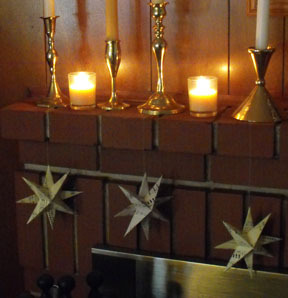 As you decorate your home, think of ways to further His kingdom on Earth. This past weekend wasn’t just Thanksgiving. It was also the first Sunday in Advent. I’ll be the first to admit it – Christmas and Advent are my favorite time of year. I love Christmas trees and cookies, ornaments and lights, music and cheer. But I also love the introspection that comes with Advent. Advent means beginning. In this case, the beginning of God’s time on Earth. We are preparing for His arrival. 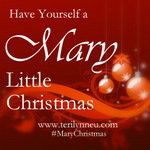 And in a sense we do that with our Christmas celebrations – we prepare for the arrival of that precious Babe. We set up manger scenes. We gather together gifts for the children in our lives. We bring out our Advent calendars. We remember the Christ child and his family when we give to those who have been turned away by our own society, whose lives are difficult. It is a time of giving. We give to food pantries and shelters. But to truly prepare for the coming of the Lord, we need to go deeper. What can we do to impact the lives of these people – the neglected? The poor? Because once they eat that meal at the shelter, its done and gone. How can we impact their lives on a day-to-day basis? Here are just a few suggestions. If your own checking account is near empty, not to worry. You can help without writing a check. Donate to an organization that helps people feed themselves long term. My family’s favorite is The Heifer Project. Donate to an organization that helps people find long term or permanent housing. We donate to Habitat. Write a letter to your state or federal congress people requesting increased health care, including mental health care, for the poor. Many of our homeless are mentally ill, people who no longer have a place to find help with recent budget cuts. Do you know someone without extended family in your area? Invite them to dinner. And not just Christmas dinner. Invite them over after church one Sunday before Christmas. Clean out your coat closet. Many of us have an outgrown coat from one of our children. Donate that to a coat crib so that another child can be warm. Reach out to those around you who need help. When you do, you are preparing your heart for His coming. 29 Oh, give thanks to the LORD, for He is good! At a family reunion years ago, I ran into a distant relative and we chatted. She was honest about her struggles with drugs and alcohol, and started to launch into her very personal, very painful story, but then stopped herself all at once. “That was another time. Today is a good day,” she concluded, and we went over to the buffet to browse. Maybe that’s a key to life. Editing your own story into a Reader’s Digest condensed version that ends on a grace note. As for me, whenever I talk about troubles, I find that I fall into a bit of a funk. So instead I cut to the chase. Different eras would have unique taglines. Cast my pearls before swine. God forgave me and cleaned me up. Been through a few things. God’s grace brought me through. There’s a reason that this verse is in the present tense – “This is the day the Lord has made” – because that way, we may remember to trust God right where we are. Don’t know what tomorrow may hold. But I know Who holds tomorrow. One of my favorite Thanksgiving hymns, something of a prayer in song. This fall, I joined the Lydia’s Circle at Florissant Presbyterian Church. Why? Sometimes I feel like the only women I know well are my fellow choir members and the women who come to book club or prayer group. I wanted to widen my circle a bit and this seemed like a good way to do it. What I didn’t expect, and still haven’t entirely deciphered, are the various offerings they collect. I may not have deciphered all of them, but I have latched on to one of them – the Thanks Offering. a note from my editor that she is taking my book manuscript to committee. Blessings big and blessings small. They’re there. Sometimes we just need to remember to count them. As much as I appreciate these invitations, I’ve started my own tradition: “Holiday Helping.” I’ve helped out at the food bank, the home for unwed mothers, and the cancer society – so I’m surrounded by strangers during the holidays. Not a relative in sight for miles around. This is a true gift, and it all started because I had nowhere to go for the holidays and felt all alone in the world. I can tell you this: not only do I no longer feel alone; I know that sometimes prayers are answered in ways you don’t expect. So when I run into an old friend and see that tilted-head/sad-eye look coming at me, and I can feel that “pity” turkey-day invitation coming, I can look her in the eye and say it like I mean it.